—wherein we leap, fingers first, into the world’s best nonfiction on a quest to make your day a little bit smarter—is here and ready for listening! We’re all excited for you to hear the first episode, and maybe a little nervous, too. We’ve been joyfully communicating with the written word since we learned to jam consonants and vowels together, but we’re quite new to the world of spoken media. This means that, naturally, we’re also extremely excited to get better. Which brings us to an important place: the beginning. Together. This, dear readers, is your podcast, too. We’re counting on you to help shape the future of the Blinkist podcast—and help us get better at what we’re doing while we’re at it. Start by listening to episode one here, liking it on SoundCloud, and leaving a comment, and then write us at podcast@blinkist.com with your feedback and ideas. Episode #1: Is That Even a Thing? What does butter in coffee actually give you (apart from greasy lips)? Is exercise as good for the brain as it is the body? Is fasting really beneficial to your mortal husk? And what in the name of Buddha does “mindfulness” mean in practical terms? In this first episode of the Blinkist podcast, Ben and Caitlin dive into four great books to debunk these questionable truisms. Plus, The Book Doctor is in! We write the perfect literary prescription for your most burning questions. If you’re bored with the elliptical but still want to benefit your brain, you could try aping, like early humans (and this guy) did. The magic’s in the MCTs (the desirable sort of triglyceride in grass-fed butter). Here’s a bit of the science behind the effects MCTs have on your diet and health. A clear, curiosity-inciting article on alternate-day fasting by James Clear. I’ve got to admit—I’m now sold on testing it out. 5 ways to meditate for meditation skeptics. Drivers, instead of anxiously keeping your fingers off your phone, you might test out the Red Light method. Did you like what you heard today? Did you loathe it? Do you have some other opinion indescribable by absolutes? Great—to all of those choices! 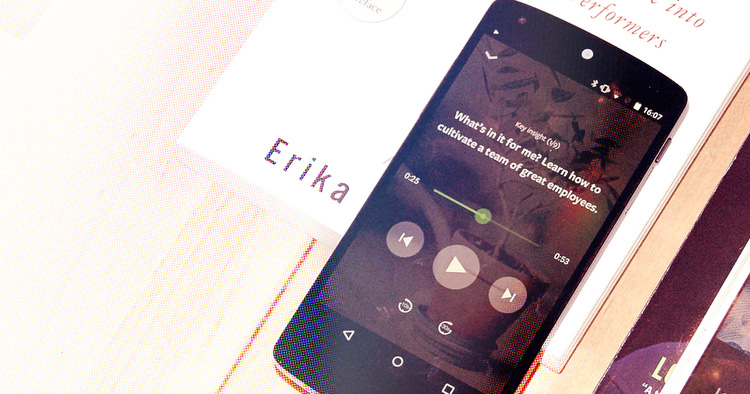 Write to us and let us know what you thought at podcast@blinkist.com. We’d love to hear your suggestions about what we could do better, what you’d like to hear us talk about, and what you’d like to ask the Book Doctor. You know those great books we talked about in the episode? The key insight summaries of their best bits are on Blinkist. You can get two weeks of Blinkist to read them, totally free. Head right over here and sign up with the code podcast. And one more thing: that excellent intro and outro music you heard is by Nico Guiang. You can find more of it on Soundcloud and Facebook.